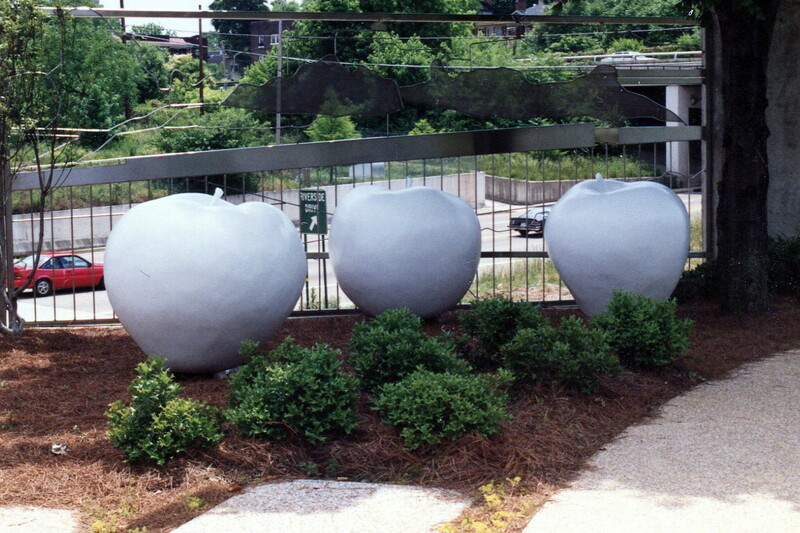 Once upon a time, there were three white apples. They were installed in the River Gallery Sculpture Garden in Chattanooga, Tennessee in 1993. They were made by the sculptor Peter MacElwain. 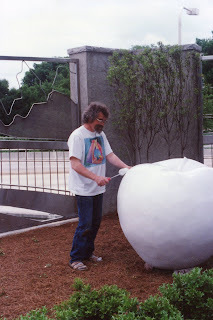 In this picture, he is putting the final touches on the apples after they had been set up in the sculpture garden. 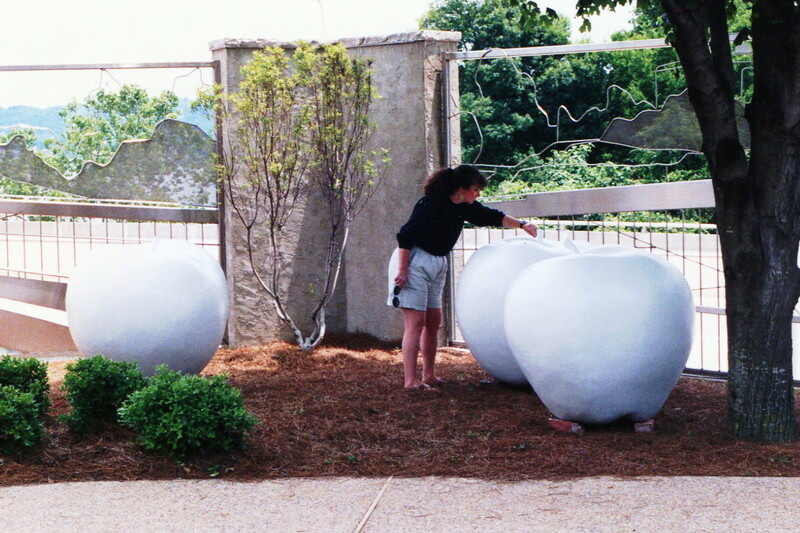 I helped Peter install the apples in the sculpture garden. It was fun taking them to Tennessee and setting them up. Two of them were sold to collectors and the third lived with me and Peter at our home in Lefaivre Ontario. Many years passed. Peter died in 2001 and I tried to take care of the sculptures of his I still had left (most were purchased by collectors). Despite my efforts, the remaining white apple deteriorated after years of sitting on my front yard. It lost its stem and needed some minor repairs, a good cleaning and a fresh coat of paint. Then this year, I was invited to show the white apple at a sculpture garden in St. Eugene Ontario. The owner of the sculpture garden, Nik Schnell, did the needed repairs, attached the new stem, and set the apple up beautifully on the grounds. As you can see, I was very happy with the beautiful restoration of this white apple. Everyone who sees the white apple loves it. Nik sent this picture to me just the other day. It shows his son Alex with his girlfriend Amber, getting their picture taken before they went to their graduation prom. 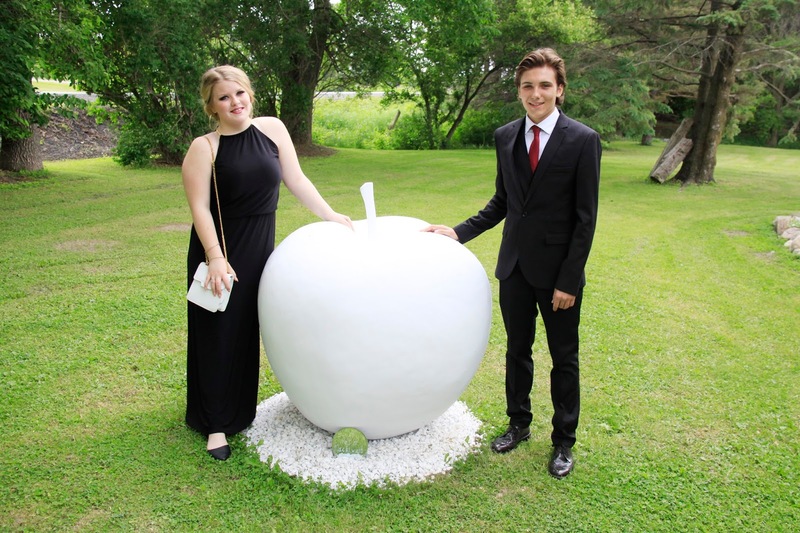 Love the contrast of white and black, especially Amber's black dress and white purse, beside the white apple. This is a particularly lovely picture for me because Alex's mother (Nik's wife) died just this past April. But an apple is a symbol of life and hope and fulfillment, so it is nice to see Alex and his girlfriend beside it. Peter would have been so happy to see this! Great post. So happy to see the white apple get a face lift! Looks great. Peter would be so pleased. Isn't it amazing to see the white apple live on! What a great story.